At the start of the year, Americans always seem resolved to make changes to their lives and routines. For many Kansans, those resolutions apparently mean migration to fast-growing states with governments that spend less, and tax less. Looking at aggregated 2016 state and local taxes per residents from the U.S. Census Bureau, it is clear that some Americans pay higher taxes than others. These included income, sales, property and other taxes from state and sub-state governments. We ranked states by their taxes, with “1” being the lowest state and local tax burden. 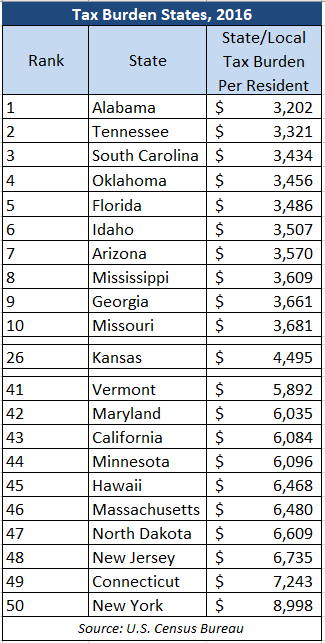 The table below (click to enlarge) shows the states with the lowest and highest taxes, and where Kansas ranks among them. Alabama is the lowest tax burden state, sitting at $3,202 taxes per resident. New York is the highest tax burden state, taking roughly $9,000 in taxes per person. Despite the 2013 income tax cuts and pass-through exemption, Kansas’s sales , property, and excise taxes remained high to rank the state 26th. Low taxes are not only beneficial in terms of families’ budgets, but they also result in faster economic growth for the area. The link is that the bigger the tax and spending burden, the less economic freedom citizens have. As an example, Kansas has government jobs well above the national average. This makes it harder for private sector employees to attract applicants. It also means government programs are providing services that free individuals are already supplying. Government taxing and spending beyond what is needed restricts available choices and opportunities for Kansans. Over the 20-year period, low tax states have outperformed Kansas and even high tax states. The chart below shows wages and jobs from low tax states growing at least 10% faster than Kansas. The information suggests that the key to reversing Kansas’s 40-year long economic stagnation is efficient government fiscal policy. However, the most notable difference is from states’ domestic migration. For Kansas, there is virtually no migration over the 12-year period. High tax states, like California and New York are hemorrhaging residents. Meanwhile, low tax states are seeing migration grow their respective populations roughly 5.5%. A growing or shrinking population dictates the area’s future economic health. As more people come (leave), demand for goods and services grow (falls). This entices (discourages) startups to satisfy wants and needs, as well, opportunities for family income growth expands (shrinks). There are low-tax skeptics out there who quickly claim reasons Americans move have little to do with low taxes. Here’s a quote from former Budget Director and Governor-Elect Laura Kelly’s transition team leader Duane Goossen. The tax cuts of 2012-13 haven’t caused people in the region or country to flock to Kansas because it’s a low-tax paradise. No surprise there—Lower income taxes have little to do with why people move to a new state, research shows. In fact, most people move to another state for a milder climate, lower housing costs or for job-related reasons. Statements such as these fly in the face of the actual data outlined above. As mentioned earlier, Kansas’s income tax cuts weren’t large enough to offset the higher costly environment made by its sales, property, and excise tax policy. In addition, every reason for moving, at the very least implicitly, considers government tax and spending policy. In its survey of migration patterns, the U.S. Census Bureau asks Americans for their reason for moving. To Duane’s credit, the top answers are housing related, or job and family related. However, it is not difficult to grasp how taxes lay a foundation to moving decisions. Americans may consider property taxes in the listing of homes and in potential school districts they could reside in. Also, Americans searching for jobs can be dissuaded from moving if taxes take too much of their take-home pay. Getting married in a different state may mean different tax treatments of a married status than what was initially expected. As for moving for milder climate or some natural feature, yes, people can move for beaches and mountains. Such things cannot be helped. What can be helped are taxes, spending, effectiveness etc. No one would move to or stay in a place, regardless of its beauty, if it is too expensive to provide for their families. Ask California. Critics of low taxes may still make the argument that what encourages people to move are well funded government programs. The Kansas Policy Institute wholeheartedly agrees; core government services should be provided. However, that is not an excuse to simply throw tax dollars at inefficient programs. Government is made possible by the dollars it takes from families and businesses. As spending rises, if left unchecked, taxes will also rise. We charted the relationship between state spending and Kansas migration. The vertical axis is migration and the horizontal axis is state spending per resident. The dotted vertical line is Kansas’s state spending. Any blue dot left of the dotted vertical line is a state with lower spending than Kansas. Any blue dot to the right is a state with higher spending. A blue dot above 0.00% is a state that Kansas attracts people from. A blue dot below 0.00% is a state that Kansas loses its own residents to. The red line follows the trend of all states on the map, moving from bottom left to upper right. It trends higher spending of other states leads to Kansas attracting their residents. It also says the compliment. Lower spending of other states leads to Kansans leaving for those states. For example, big spender governments like New York and California spend more dollars per resident than Kansas. Not surprisingly, they also collect more taxes than Kansas. With that fiscal burden, roughly 2,000 of their residents, on balance, left for the Sunflower State. 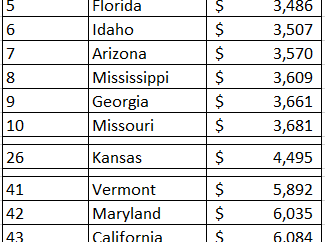 Meanwhile, next door neighbor Missouri, and other low spending states like Tennessee and Texas, spend less than Kansas. As such more than 3,000 Kansans, on balance, migrated there. Kansans need services that likely only government can provide, but it must be affordable. If there are similar or better services at a better price (tax) in other states, then why should Kansans stay? The answer is they don’t. Governor-elect Laura Kelly and her administration won’t reverse Kansas’s out-migration if their focus is solely on expanding Medicaid and raising school funding. Also, leaving the state’s fiscal deficit unchecked will only worsen the Kansas exodus. It isn’t solely about low taxes, it’s about where Americans can be the freest. 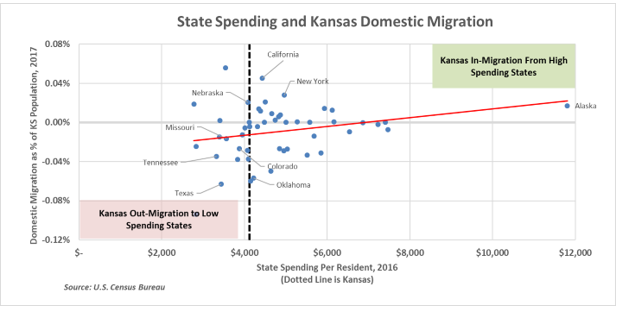 Policymakers should look at Kansas’s migration and use it as motivation to find ways to move that dotted line to the left (ironically enough), to lower the state spending burden on Kansans. It would be a noble and attainable New Year’s resolution that creates an opportunity to lower taxes, reverses the state’s out-migration, and gives more freedom to Kansans.